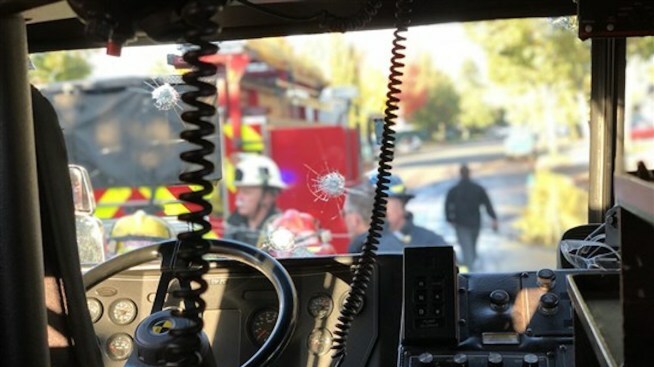 A firetruck is riddled with bullet holes after a man ambushed firefighters after setting his home on fire in Springfield, Oregon on Oct. 18 2018. An arsonist ambushed Oregon firefighters by torching his own house then shooting a rifle at the first responders, authorities said Thursday. Lance Taylor Jacobs, 60, eventually turned the gun on himself and ended the brief standoff early Wednesday morning in Springfield, Oregon, police said. After Jacobs sent firefighters fleeing for their lives, flames spread to three other homes in the 500 block of Oakdale Avenue, which is about four miles northeast of the University of Oregon in neighboring Eugene, NBC News reported. All four houses burned down but no neighbors, firefighters or police were injured, officials said. One round tore through a firefighter's pants cuff.